By now you’ve seen the book: lying open on someone’s desk at work, full of quirky cartoons, big fat arrows, and Post-it notes everywhere. In a little over a year, Alexander Osterwalder’s Business Model Generation has become the must-have handbook for entrepreneurs exploring and refining their business model. Osterwalder spoke last Thursday as part of the Strategic Innovation Lab’s Unfinished Lecture series at OCAD. 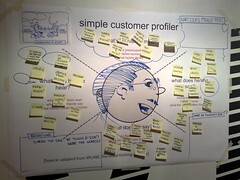 He explained the value of the book’s core offering, the Business Model Canvas, as a concrete way of bringing the visual language of design-thinking to the process of exploring business models. He went further and described the process of creating the book itself, the content of which had been around for many years in the form of a densely-worded PhD thesis. But no one was paying attention. So to popularize his theories, he sought to represent his ideas in a reader-friendly way. “We tried to create the kind of book that we would want to buy,” he says. True to the lessons of the book, the process was far from orthodox. “We couldn’t write a book about business model innovation without having an innovative business model,” says Osterwalder. Add to that the fact that Osterwalder and and his PhD advisor Yves Pigneur were relative unknowns in the business world at a small business school in Switzerland and the traditional route to publishing was closed to them. In response, Osterwalder created a community on Ning.com where for $24 people could pay to be a part of the book’s creation. They’d get their name in the book as a “co-creator” and would have first crack at reviewing sections of the book. Participants contributed re-writes, case studies and design suggestions that made the book the best it could be. “Who would have thought people would pay to write a book?” says Osterwalder. And pay they did. At a price-point of $24, they quickly gathered together a community of 100 people. So they doubled the price and even more people bought in. The price eventually rose to $243 and two people still bought in. “People want to be a part of something,” he says. In the end they included the contributions of 470 people from 45 countries around the world, every one of them listed on the inside cover. This allowed Osterwalder to print 5000 copies of the book which they sent to Amazon to sell on consignment. This first run sold out quickly, landing them at the number two spot in business section sales. This flurry of activity caught the eye of the publishing company Wiley, who quickly signed a deal for global distribution.